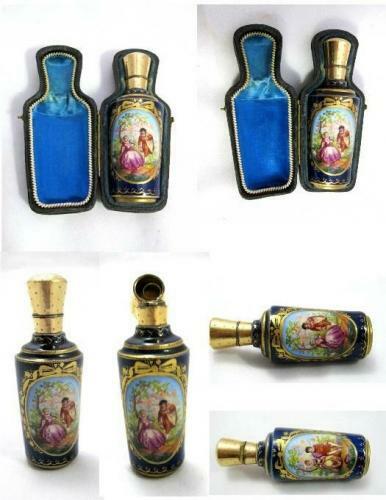 An Antique Dresden Porcelain Scent Bottle of Cylindrical Tapering Form Decorated with Reserved Panels of Courting Couples on a Cobalt Blue Ground and in a Fitted Leather Case. 14 Carat Gold Oak Leaf Mark on the Stopper. Beautifully Hand Painted in Original Leather Case.